For a Memorial Day weekend activity my wife and I took our two month old daughter Hazel to visit some classic Hollywood stars at Forest Lawn Memorial Park in Glendale, California. This cemetery, established in 1906, is one of my favorite locations in the Los Angeles area. 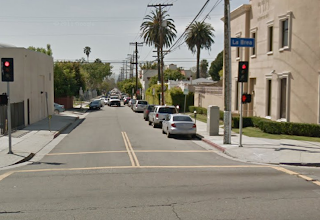 For an area that can sometimes feel too brown, dusty and dry Forest Lawn is a nice little escape into rolling green hills, trees, large water fountains, and flowers. 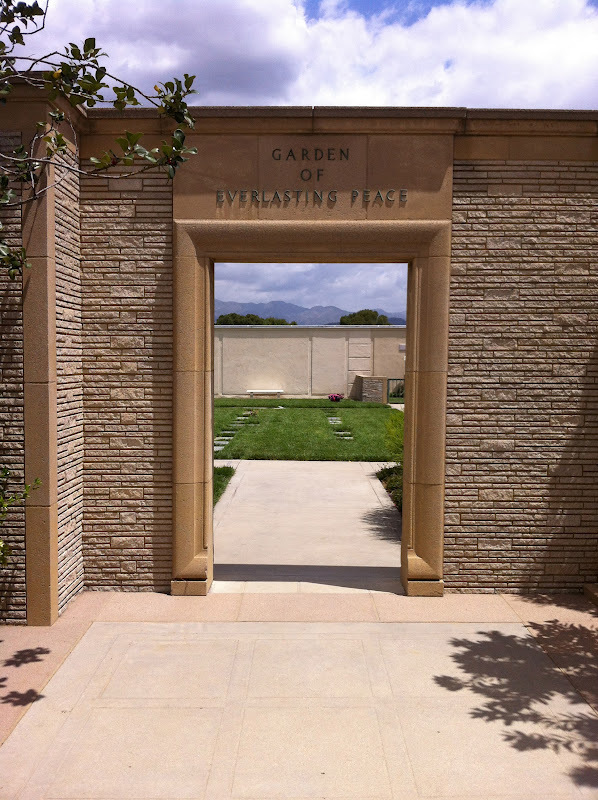 As far as cemeteries are concerned, Forest Lawn is gorgeous. 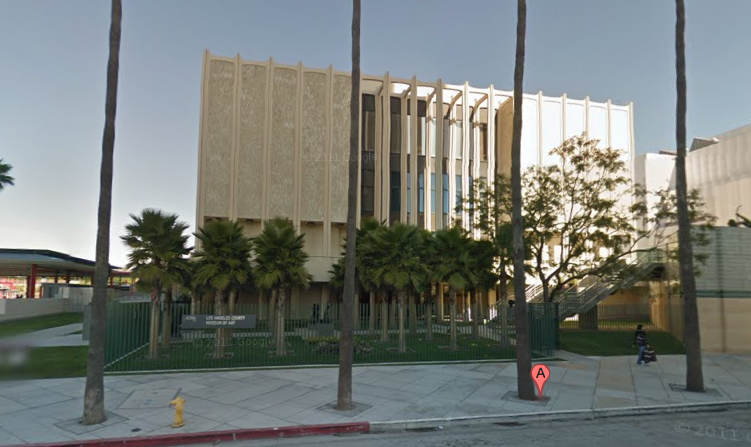 There are also the added sites of art exhibits, buildings modeled after old world architecture, and spectacular views looking over Glendale and out to downtown Los Angeles. On this visit though, we had one specific destination inside the cemetery grounds in mind; the Freedom Mausoleum and the Court of Freedom. There are many different areas around the cemetery, each with a distinct name, and the Freedom Mausoleum and Court of Freedom are located near the back of the cemetery grounds at the top of one of the winding hills. 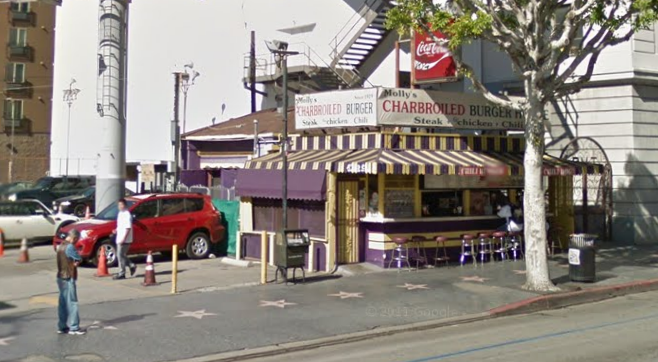 There are several old Hollywood celebrities that can be found in this area including Chico Marx, Gummo Marx, Clara Bow, George Burns and wife Gracie Allen, Nat King Cole, Alan Ladd, Spencer Tracy, Errol Flynn and Walt Disney to name a few. Walt Disney's garden is to the left of the Freedom Mausoleum. Our first visit was to a garden located just to the left of the Freedom Mausoleum entrance. There is a short stone wall with a little gate. If you open the gate and look up at the wall that is often covered by trees and large plants you will see a plaque with the names of Walt Disney, his wife Lillian, his daughter Sharon and her husband Robert Brown. Unfortunately, when we mentioned Disney to Hazel, she was expecting rides. She was a bit disappointed. "No rides, Daddy? Just a plaque with some names?" 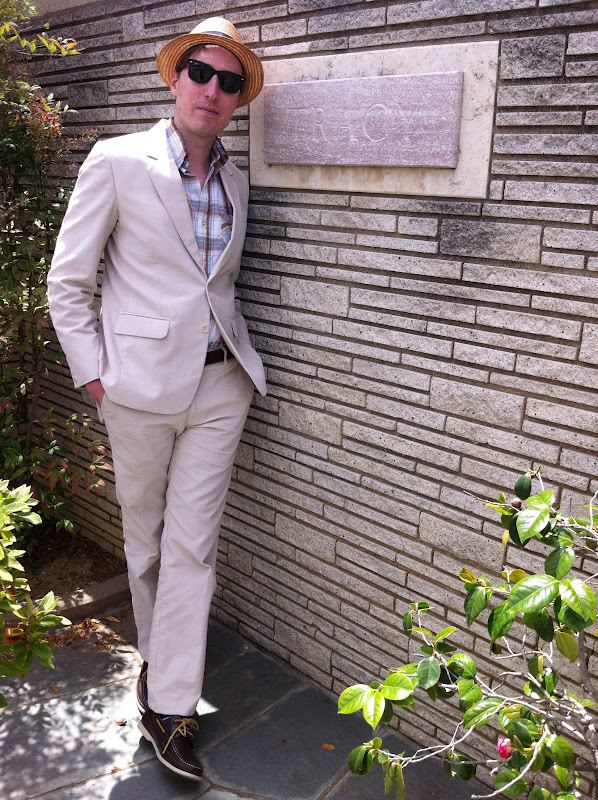 We then went inside the Freedom Mausoleum to visit the husband/wife comedy team, George Burns and Gracie Allen. Their crypt reads, "Together Again." Gracie died in 1964 and Burns didn't pass away until 1996 - thirty-two years later! George Burns loved Gracie and missed her very much after she passed away. For a very entertaining and funny read about their relationship, I recommend the book Gracie: A Love Story, written by George Burns. Gracie died in 1964, and I still go to Forest Lawn Cemetery once a month to see her. I stand in front of her marble monument and tell her everything that's going on in my life. I told her I was writing this book about her, for instance; evidently she didn't mind, she didn't say anything. 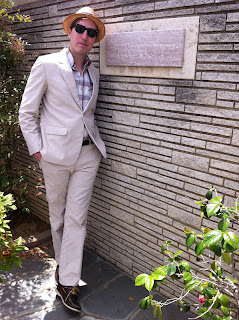 When the television program "60 Minutes" did a segment about me, I took their crew to Forest Lawn. 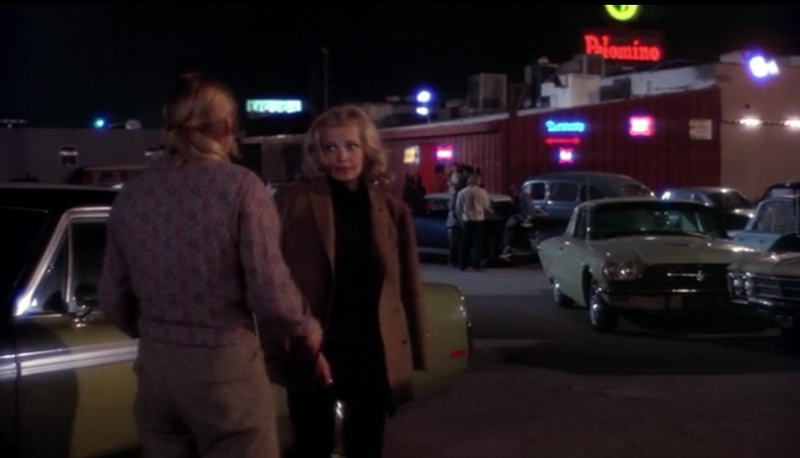 "Imagine that, Googie," I told Gracie. "After all this time we're working together again." I don't know if she hears me, but I know that after speaking to her, I feel better. Gracie Allen and George Burns. "Together Again." A crypt next to George and Gracie is another couple where the husband long outlived the wife: Gene Raymond and Jeanette MacDonald. MacDonald passed away in 1965 and Raymond didn't go until 1998! Their crypt reads "Beloved Husband" and "Beloved Wife." Next we headed back outside the mausoleum and walked out front to the Garden of Everlasting Peace. 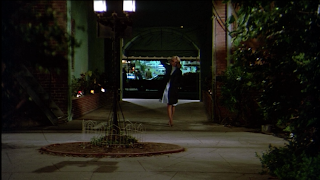 Inside this garden courtyard is one of my favorite actors, and in the minds of many, one of the greatest American actors to have ever lived, Mr. Spencer Tracy. Spencer Tracy passed away on June 10, 1967 at the age of 67. 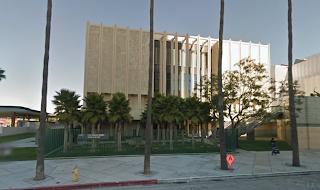 A requiem mass was held at Immaculate Heart of Mary Catholic Church in East Hollywood on Monday, June 12, not too far from Forest Lawn in Glendale. According to the recent biography, Spencer Tracy, by James Curtis, "serving as active pallbearers were George Cukor, Stanley Kramer, Bill Self, Frank Sinatra, Jimmy Stewart, John Ford, Garson Kanin, and Abe Lastfogel. Numbered among the honorary pallbearers were Edward G. Robinson, Lew Douglas, Robert Taylor, Larry Weingarten, Benny Thau, Tim Durant, R. J. Wagner, Loyal Davis, Chester Erskine, Harold Bumby, Chuck Sligh, Jack Benny, George Burns, Mike Romanoff, and Senator George Murphy." A smaller and private graveside ceremony followed the large celebrity attended mass. 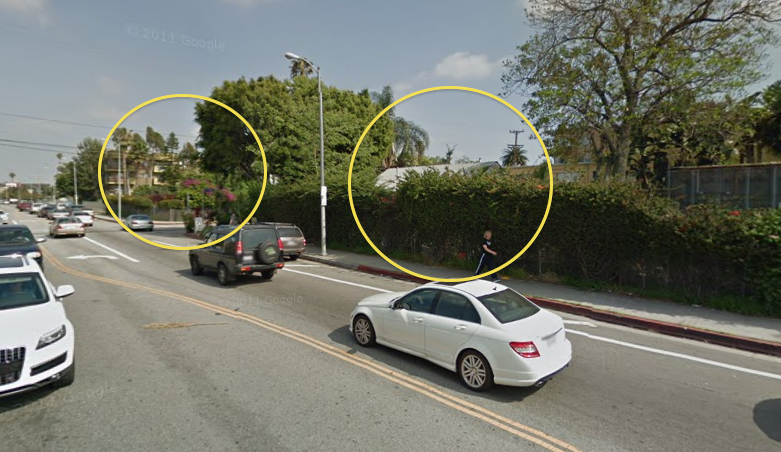 A gated garden plot for Spencer Tracy. The marble tablet only reads "Tracy." Unless you know where you're looking, finding some of the celebrity grave sites can be difficult. Forest Lawn is a massive cemetery. However, if you can make your way to the Freedom Mausoleum, you will be able to find quite a few recognizable names both inside and around the grounds outside. 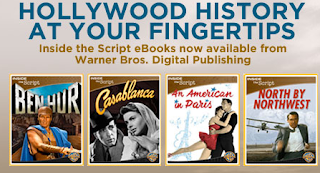 With the new "Inside the Script" eBooks from Warner Bros. film fans can read classic movie scripts like North By Northwest or Casablanca and also delve deeper into the making of the film with supplemental chapters on the film's development and production. The eBooks will include items like costume sketches, on-set photographs, production notes, and storyboards with internal links that immediately take you from the scene to the additional content. I have yet to read one of these new eBooks but I love the concept. I think I may start out with one of my favorite films, North By Northwest, but I would like to see one done for the film Sunset Boulevard (but that one will probably require approval by Paramount). Other eBooks in the series include the epic Ben Hur with Charlton Heston and An American in Paris with Gene Kelly and Leslie Caron. The eBooks are available for Kindle, Nook by Barnes and Noble, and iBookstore and the cost is $9.99 per eBook. Have you tried one of these new Inside the Script eBooks? 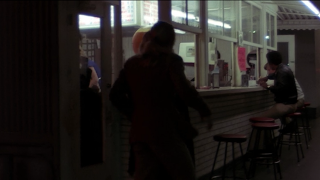 What film script would you most like to see get the Inside the Script treatment? 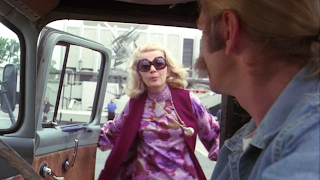 Minnie Moore (Gena Rowlands) is a quiet, highbrow, museum curator in Los Angeles who feels that the "movies are a conspiracy. They set you up to believe in everything. They set you up to believe in ideals and good guys and romance and of course, love." But, there are no guys like Clark Gable or Humphrey Bogart in real life. Those guys are only in the movies. "There's no Charles Boyer in my life" Minnie tells her friend Florence. 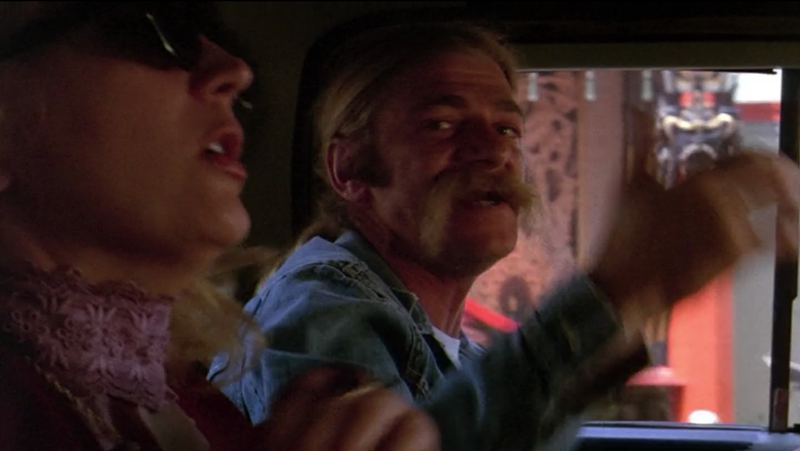 Seymour Moskowitz (Seymour Cassel) is a loud, spontaneous, hippie who leaves New York for Los Angeles and becomes a parking attendant. Seymour has no real goals in life. The only thing that he is sure of, is that when he meets Minnie, he's in love. Minnie and Seymour are not your likely couple. She's sophisticated and attractive. 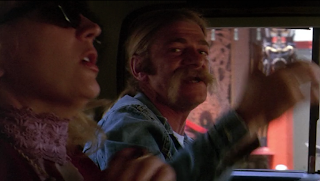 He's a simple bohemian with a giant walrus moustache, but although Seymour is no Gable, Bogart, or Boyer, Minnie likes something about him. The one thing they do have in common is a wanting to belong to someone, to be a part of a loving relationship. John Cassavetes directs this delightfully real looking film about relationships, that is nothing like those in the movies that his characters talk about. 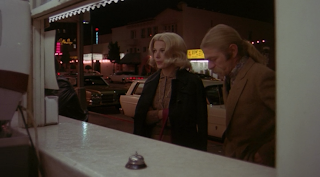 What really makes the film work though are the engaging performances by Cassel and Rowlands. The two have created a couple of interesting characters that are believable and entertaining. For those that only know Cassel from his character parts in eccentric Wes Anderson films or Rowlands from contemporary films like The Notebook, will be interested to see these two actors in a film where each was just at the beginning of their long acting careers. 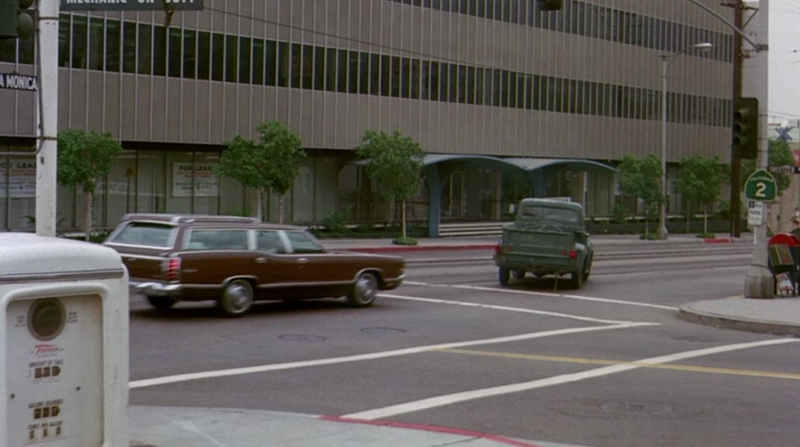 The film begins in New York but quickly jumps to Los Angeles when Seymour decides he needs a change. The first thing Seymour does is find an apartment. Although we don't get a good view of the exterior of the apartment building in the film, we can place the building's location from the view of the historic Alto Nido Apartments (the same apartment building seen in Sunset Boulevard) located across the 101 Freeway. 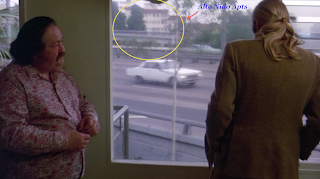 We can also identify the building from the glimpses of the balcony and railing that are seen in the film. 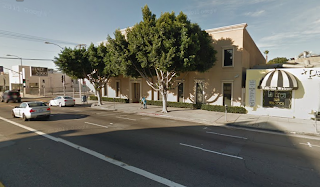 The address for the building is 2001 Ivar Avenue, Los Angeles. 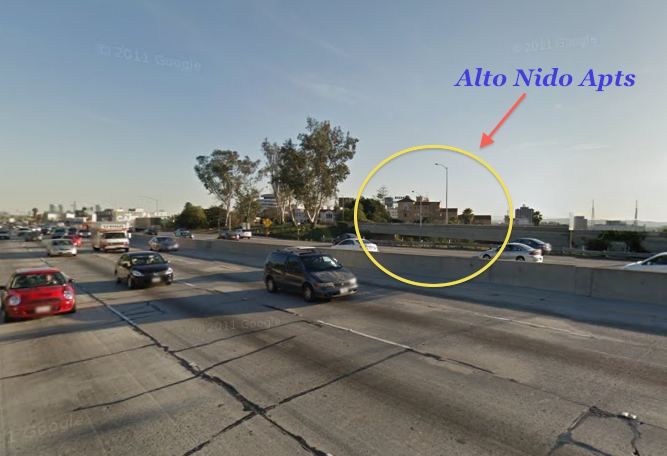 The Alto Nido Apts can still be seen across the 101 freeway. 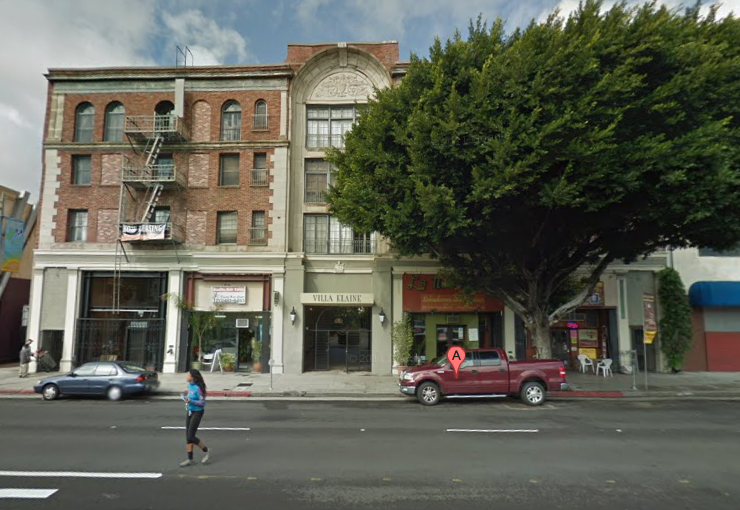 Minnie's apartment building is the Elaine Apartments located at 1245 Vine Street in Hollywood. 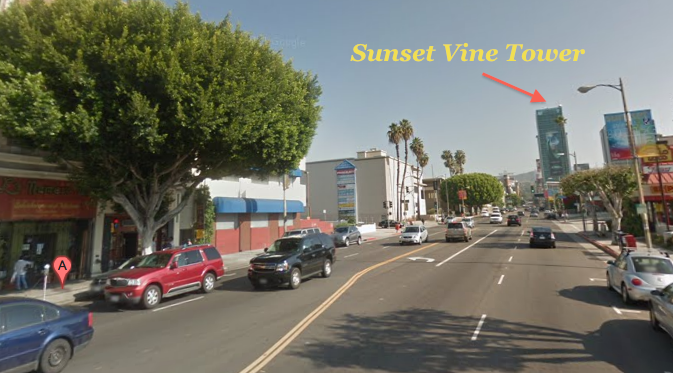 Looking North on Vine from outside the apartment building you can see the Sunset Vine Tower in the distance. Looking North from 1245 Vine Street in Hollywood. Looking North from 1245 Vine. Sunset Vine Tower in the background. Minnie enters the courtyard of the Elaine Apartments. The Elaine Apartments as they appear today. 1245 Vine St.
Another view of Minnie in the Elaine Apt courtyard. 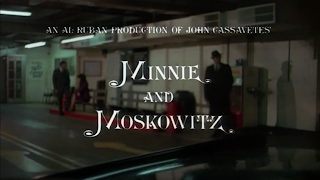 When Minnie meets Seymour for the first time its while on an unsuccessful date with the lonesome and boring Zelmo Swift (Val Avery). 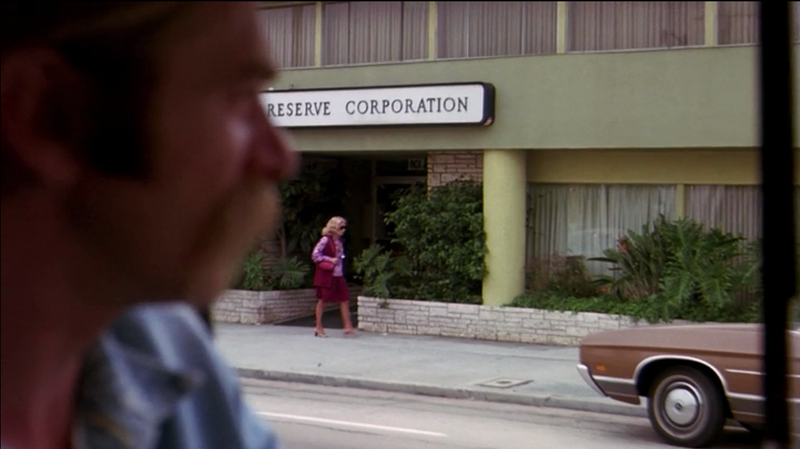 Minnie and Zelmo meet for lunch at a restaurant at the corner of Fountain Avenue and La Brea Avenue. The restaurant building has been replaced by a new building and a Mayfair Market that can also be seen in the background has now been replaced by another building. 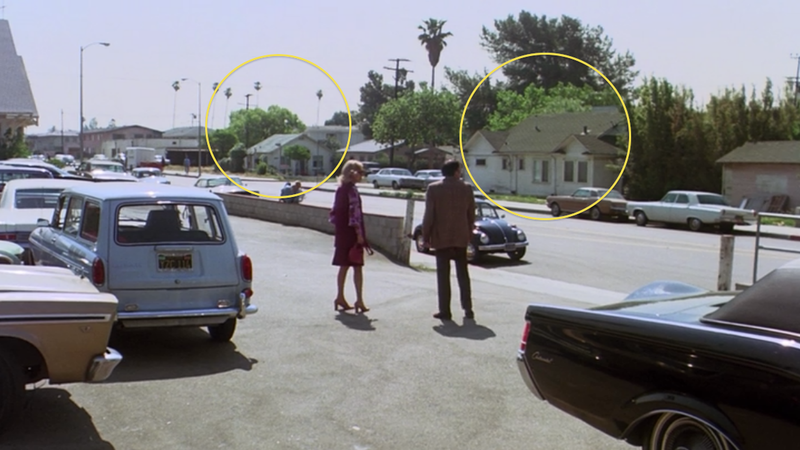 The yellow circles and the red square show two homes and an apartment building that can still be seen at the location. 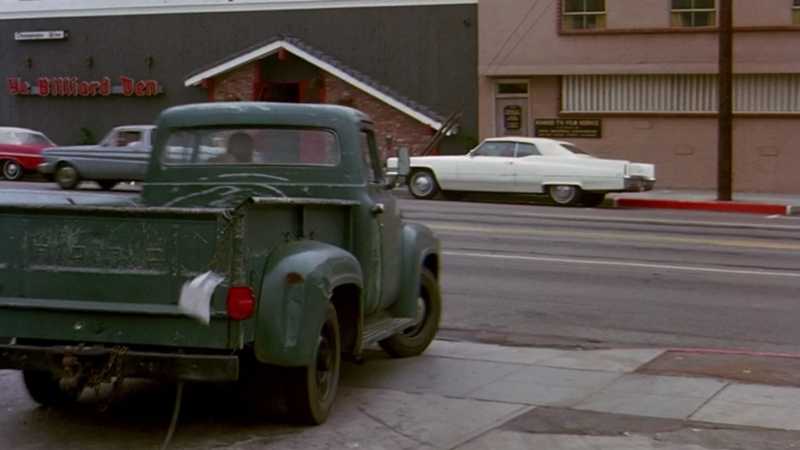 Minnie & Zelmo in the restaurant parking lot on Fountain Ave. 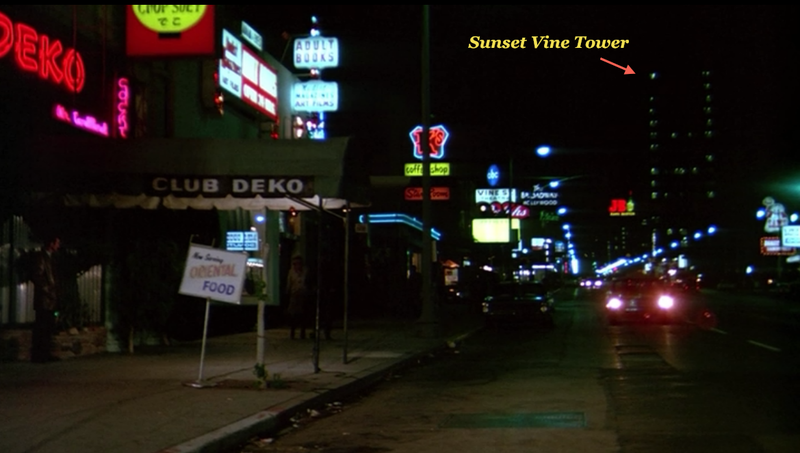 Looking East down Fountain Ave near La Brea Ave.
Minnie & Zelmo exit the restaurant. Above Minnie and Zelmo can be seen leaving the restaurant. 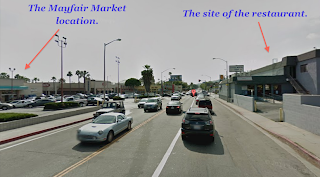 In the background is a Mayfair Market located on the corner of Fountain Avenue and La Brea Avenue opposite the restaurant. 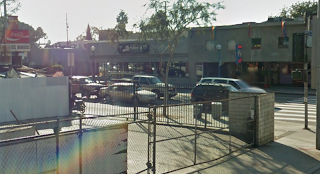 Below is an image looking West down Fountain showing the restaurant location on the right and the former Mayfair Market location on the left. Both the Mayfair Market and restaurant have been replaced. 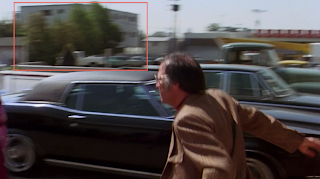 In the seen below, as Zelmo runs into the restaurant parking lot, in the red box we can see an apartment building located next to where the Mayfair Market once stood. That apartment building is still standing. Apartment in red box across from the restaurant location. 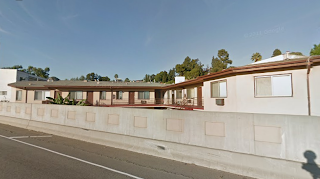 The apartment in the red box is still standing. The aerial shot below shows the intersection of Fountain Avenue and La Brea Avenue. 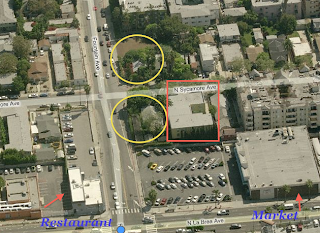 The restaurant location can be seen in the lower left and the market location in the lower right. The two houses (see yellow circles) and the apartment building (see red square) are still standing. 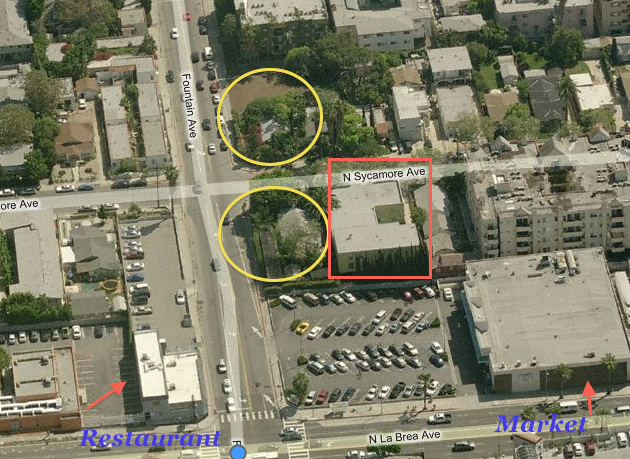 Aerial view of the restaurant location. Minnie first meets Seymour in the parking lot of the restaurant where he is working as a parking attendant. 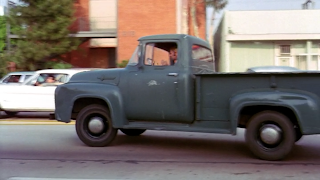 Seymour rescues Minnie from her uncomfortable date and then drive off together and go on their own date. And where do they stop on their first date? The iconic Pinks hot dogs located at 709 N. La Brea Ave! Seymour and Minnie have a dog at Pinks. 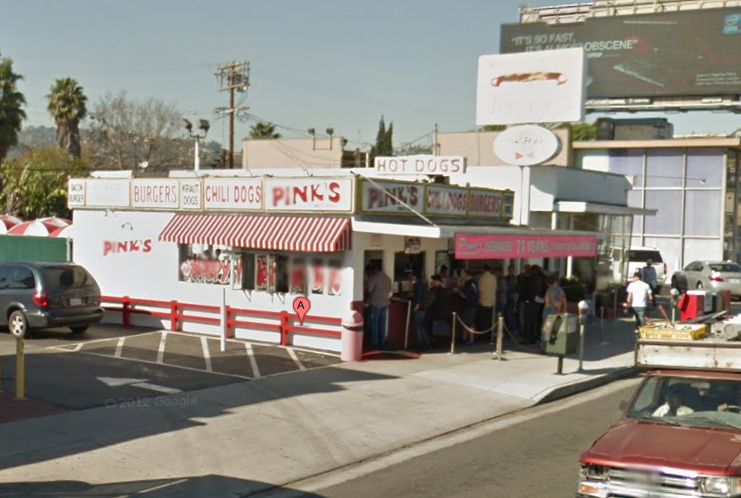 Pinks hot dog stand, 709 N. La Brea Ave.
Seymour & Minnie on the sidewalk outside Pinks. Looking North up La Brea Ave from Pinks hot dog stand. 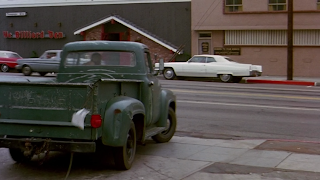 Seymour and Minnie get into an argument while at Pinks and Minnie takes off running North on La Brea Avenue. Below Seymour follows Minnie up La Brea in his green truck. 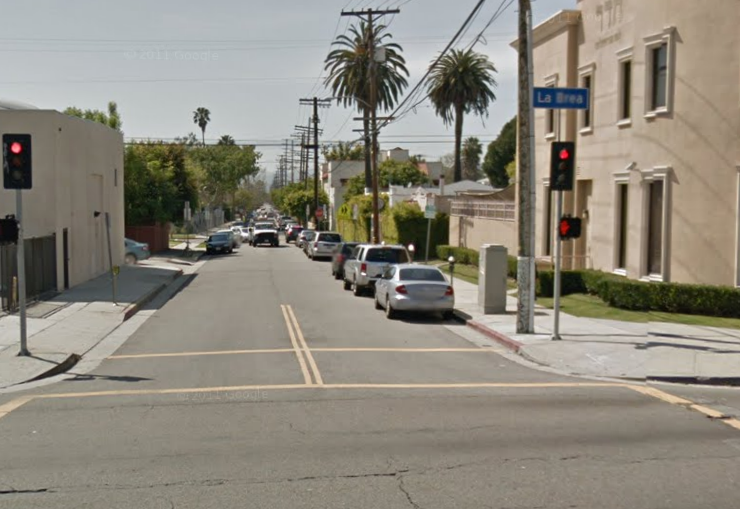 Seymour looks at Minnie at the intersection of La Brea and Waring Ave.
La Brea and Waring Ave. as it looks today. 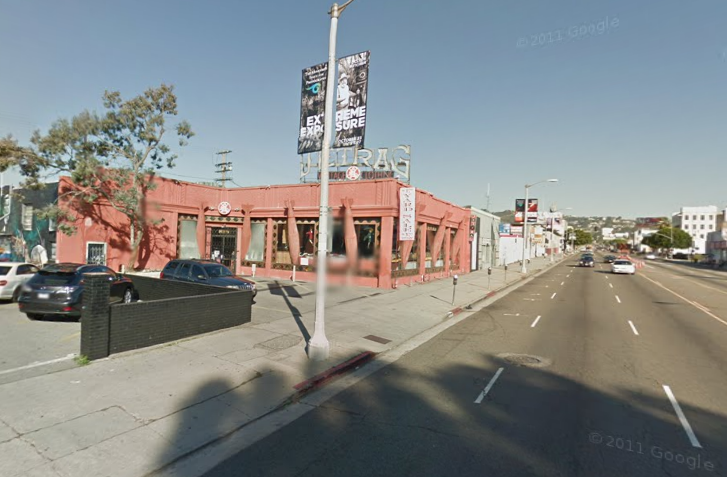 Looking at 811 N. La Brea Ave, Los Angeles. 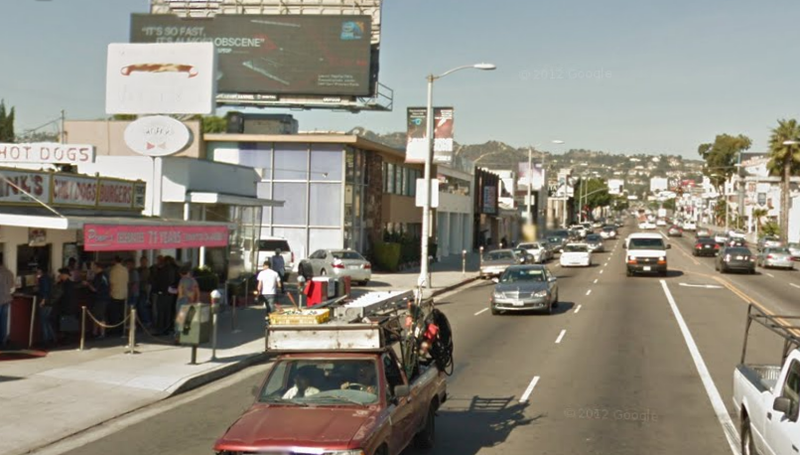 Looking North near 817 N. La Brea Avenue. Seymour turns his truck at 818 N. La Brea Ave.
818 N. La Brea Avenue, Los Angeles. 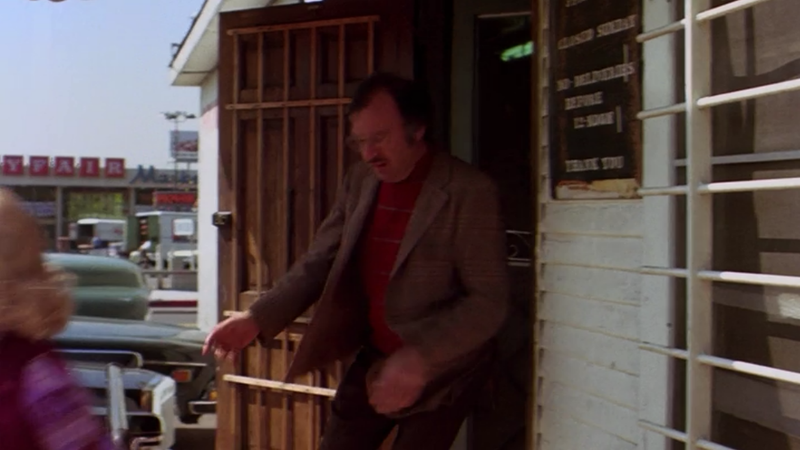 Seymour eventually talks Minnie back into his truck. The two drive around Los Angeles and pass a few landmarks. 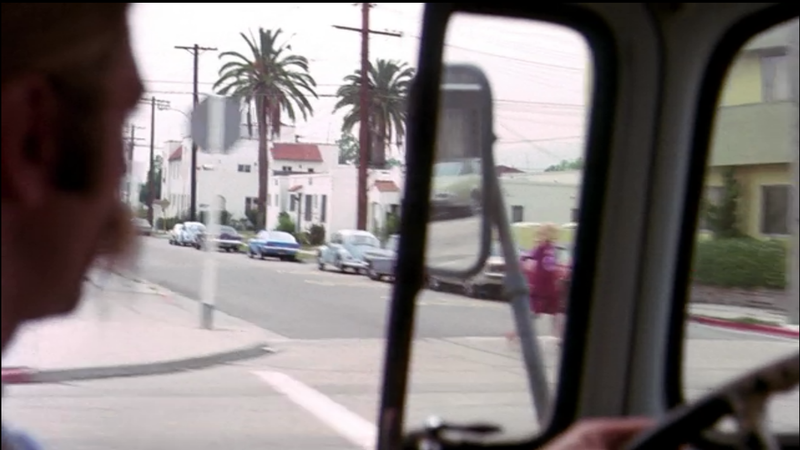 One of the landmarks which can be seen outside the truck window in the background is a glimpse of Grauman's Chinese Theater in Hollywood. Seymour & Minnie pass Grauman's Chinese Theatre. Seymour eventually drops Minnie off at work at the Los Angeles County Museum of Art (LACMA), located at 5905 Wilshire Boulevard. 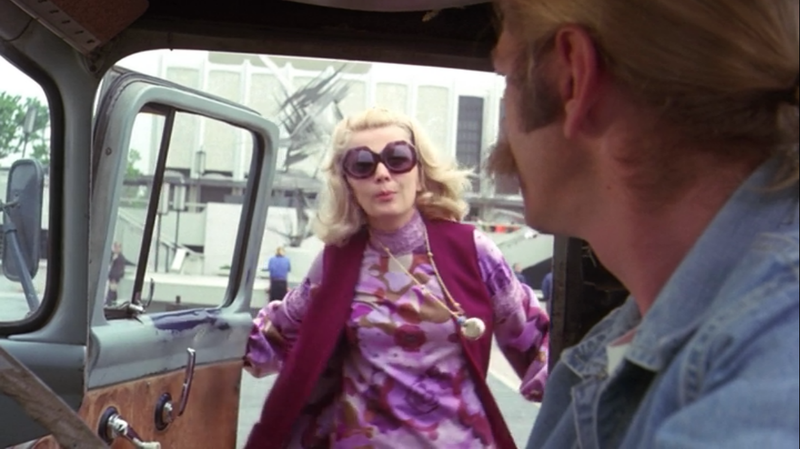 Minnie gets dropped off at LACMA. 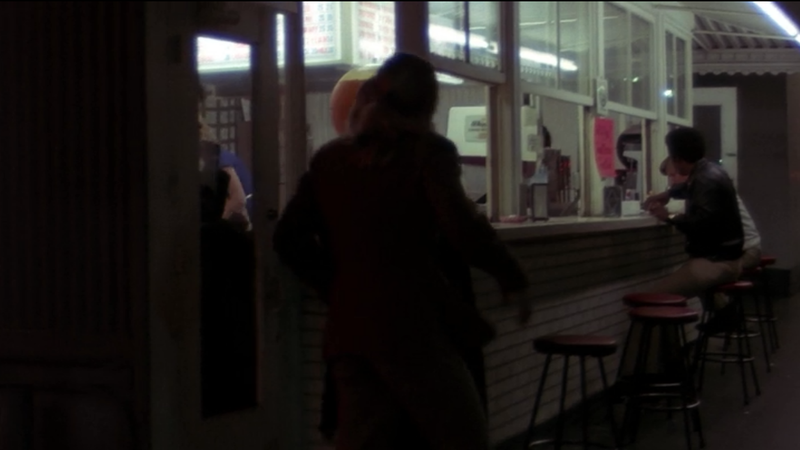 On another date Seymour takes Minnie to another little food stand, Molly's Charbroiler located at 1605 Vine Street. Unfortunately, this little food stand which opened in 1929 as part of a Richfield gas station, closed after 82 years on June 30, 2011. 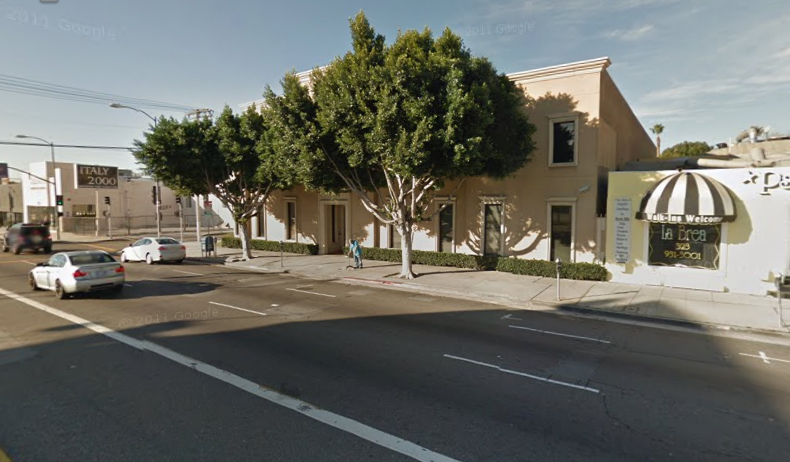 Santa Monica based Pacific Ventures purchased the property and plans to build an eight-story office building on the site. 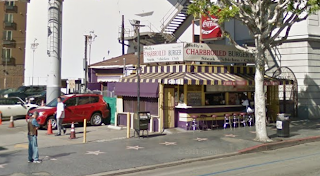 When I first moved to Los Angeles I worked just around the corner from this place and would pass it frequently on my walks, but I never stopped to grab a bite. Now I wish I had at least once! 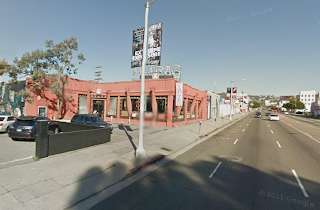 I did however visit a bar called Daddy's that used to be located across the street, but that too was torn down to make way for the new W Hollywood hotel. This whole stretch of Hollywood has changed so much in the last decade. 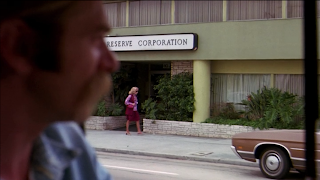 Seymour and Minnie visit Molly's Charbroiler in Hollywood. Minnie's Charbroiler, 1605 Vine Street. Minnie & Seymour at the counter of Molly's on Vine St. The W Hollywood hotel now stands in the background. 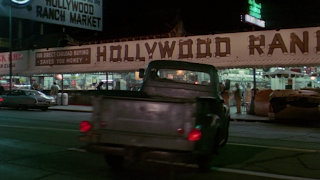 While Seymour and Minnie are driving they pass the Hollywood Ranch Market which used to be located on Vine Street between Fountain Avenue and La Mirada Avenue. 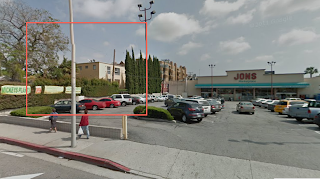 The day that actor James Dean died, he had visited the Hollywood Ranch Market in the morning for coffee and doughnuts while he waited for his race car to be finished, which was being worked on at Competition Motors across the street. 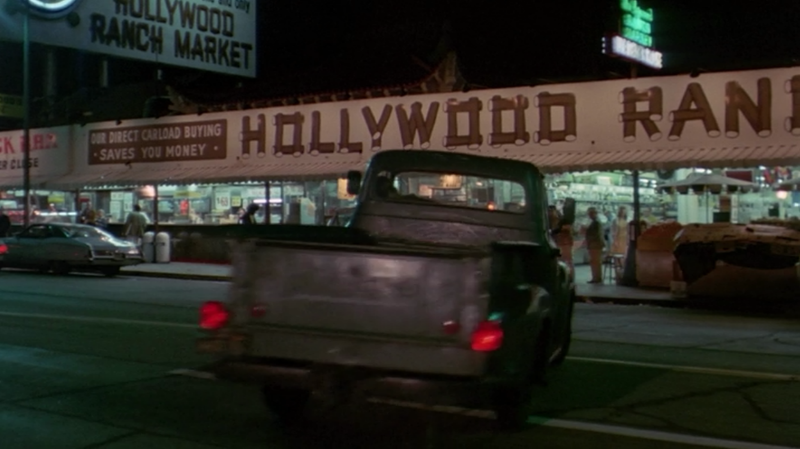 Seymour and Minnie pass Hollywood Ranch Market. 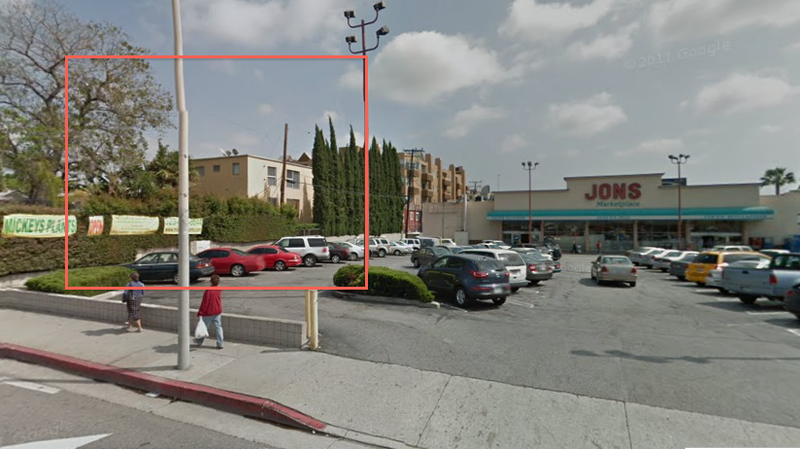 Former site of Hollywood Ranch Market on Vine Street. In another scene Seymour stops at a gas station in West Hollywood at the intersection of Santa Monica Boulevard and Sweetzer. On one corner, in the film, an old pool hall called Ye Billiard Den can be seen near where the Hamburger Mary's restaurant now stands and on the other a tall office building where the West Hollywood City Hall building now stands. 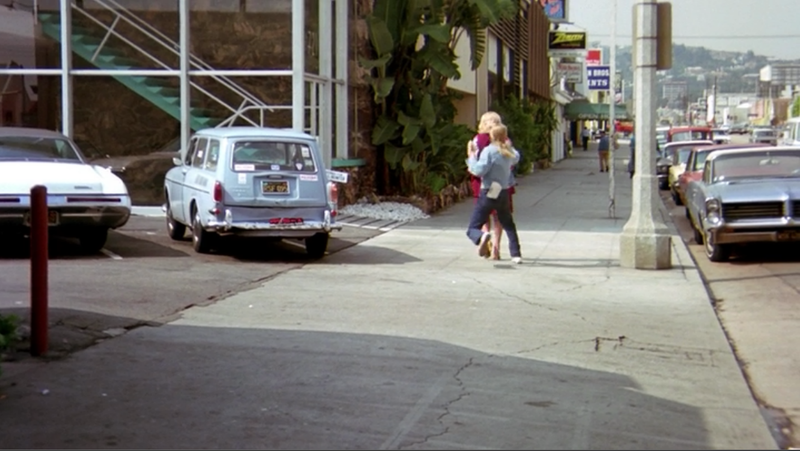 Seymour leaves a gas station at Santa Monica Blvd at Sweetzer. Looking across Santa Monica Blvd from Sweetzer Ave.
An office building stands on the SW corner of Santa Monica Blvd and Sweetzer Ave where the West Hollywood City Hall building is now located. 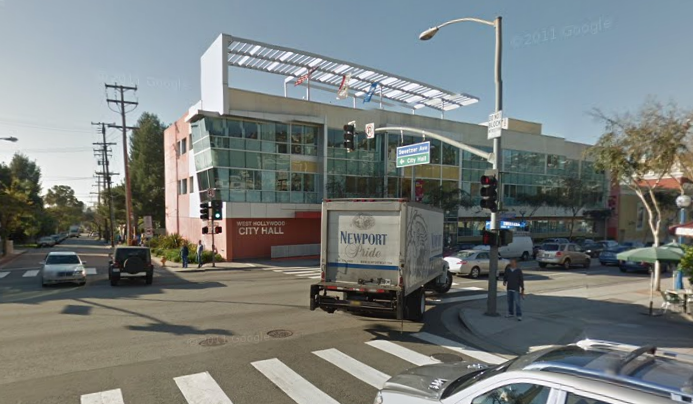 West Hollywood City Hall at Santa Monica and Sweetzer. 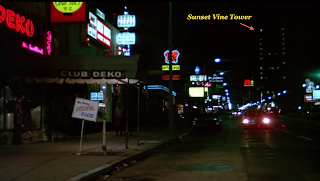 In the next location, Seymour and Minnie visit the Palomino nightclub in North Hollywood, located at 6907 Lankershim Boulevard. This country music bar was made famous in the Clint Eastwood film, Every Which Way But Loose. 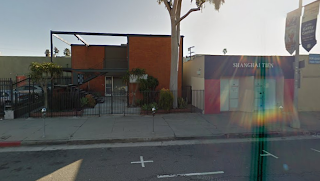 The nightclub is now the site of Le Monge Banquet Hall a Russian and Armenian banquet hall. Seymour and Minnie in the Palomino nightclub parking lot. 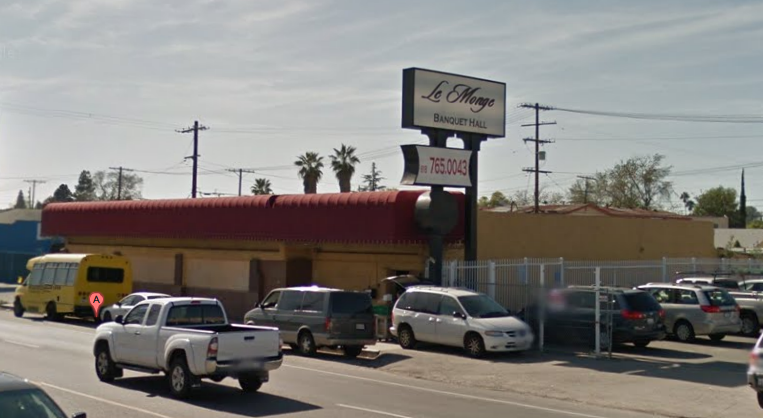 Le Monge Banquet Hall, 6907 Lankershim Blvd, N. Hollywood. 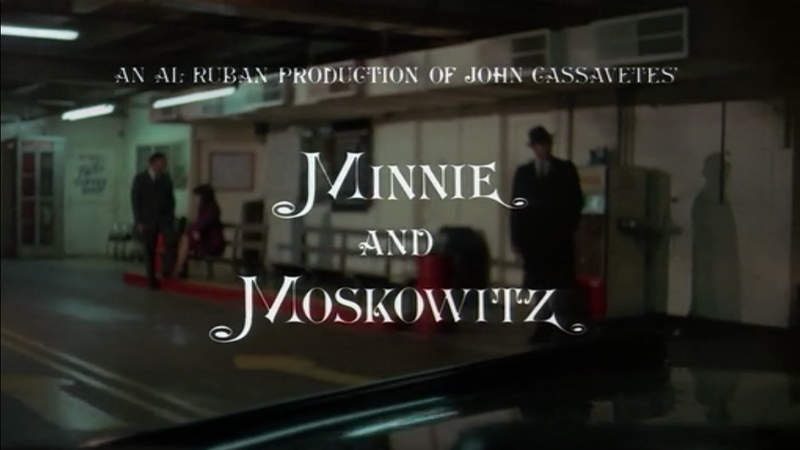 Minnie and Moskowitz was released on DVD several years ago but I think it may be out of print now. It is currently available for streaming on Netflix. Recommended for romantics, fans of John Cassavetes, and for those who have seen Annie Hall way too many times and need something new.